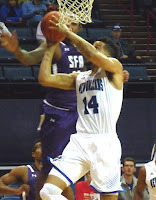 The Privateers (5-11, 1-4) avoided a fourth consecutive close loss at Lakefront Arena this evening, instead getting manhandled by Southland Conference power Stephen F. Austin, 82-58. Demetrious Floyd lit up the New Orleans defense with 32 points on 13-of-16 shooting, and reigning SLC Player of the Year Thomas Walkup added 19. UNO's balanced but mostly ineffective attack was led by Kevin Hill with 12 points. After their winless three-game homestand, UNO hits the road on Saturday night when they'll take on Texas A&M-Corpus Christi.